The economy is in recession. But how bad is it? The Minneapolis Fed is updating a series of interesting charts that places the current economic contraction into historical (post-WWII) perspective. By nearly all measures the recession is moving closer to the worst since World War II, and has already dug deeper than most downturns. 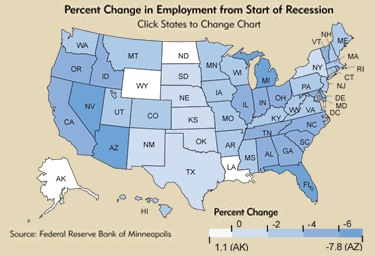 Another great feature is a chart that lets the user to compare the unemployment picture to previous recessions in all 50 states. According to the Minneapolis Fed, the 10 previous postwar recessions have ranged in length from 6 months to 16 months, averaging about 10 1/2 months. 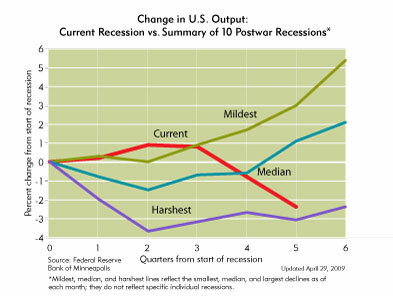 The current recession has surely surpassed the postwar average.